M.U.S.C.L.E. (which stands for Millions of Unusual Small Creatures Lurking Everywhere) was a toyline of 2-inch tall monochromatic PVC gum wrestling figures produced in the United States from 1985 to 1988. The M.U.S.C.L.E. figures were based on the Japanese toyline called kinkeshi. Kinkeshi were based on a manga and anime called Kinnikuman, and some figures were based on anime-only characters. The story involved intergalactic wrestlers fighting for supremacy of the universe. The main hero was Kinnikuman, who, in the US, was renamed "Muscle Man" in the US and was the leader of the "Thug Busters." He was described as the greatest wrestling champion. 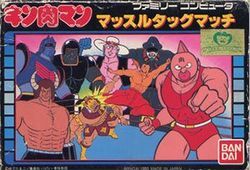 Originally released in Japan for the Famicom as Kinnikuman Muscle Tag Match, the NES title was a basic wrestling game in which 2 of the 8 representative characters from the Kinnikuman series challenge another 2 fighters to a match. Each level consists of 3 rounds which last 30 seconds. A fall is awarded to the wrestler who depletes one of the opponent's energy, thus scoring a victory for his team. The first team to win 2 falls out of 3 wins the match. Although panned in the United States as a poorly made game, it was actually the fourth best selling Famicom game released in 1985, selling approximately 1,050,000 copies in its lifetime. : Use the direction pad to direct your currently tagged in fighter around the ring. : Press the A button alone to throw a punch. Irish Whip: Punch your opponent when he is close to the ropes to perform. Clothesline: If you successfully perform the Irish Whip, press A once again when the opponent is approaching. German Suplex: Press the A button when you are behind your opponent. Partner Tag: Press A when you are in the corner near to your partner. : Press the B button to jump forward. Drop Kick: Press the A button while in mid-air after jump. Flying Body Attack: Press B when you are very close to the ropes. : Press Start to pause the game. M.U.S.C.L.E. Man (or Kinnikuman) is prince of the Kinniku People, later became the King. Like all other Kinnikumen, if he removes his mask, he must be killed. Could fly by farting early in the series. His special move is the Kinniku-Driver. After collecting the Booster Ball from Meat, stand behind your opponent, and press . Terry Man was the American stereotype of the series, and has the Kanji for "American" on his forehead. It's hard to read, though, and looks more like a simple dent. His special move is the Calf Branding. After collecting the Booster Ball from Meat, face your opponent, standing very close, and press . Ramen Man's favorite food is Ramen noodles, for which he is named. He was so popular in Kinnikuman, that he had his own spinoff manga and anime series based in Feudal China. His special move is the Leg Lariat. After collecting the Booster Ball from Meat, press and then when you are near your opponent. Robin Mask appears to be a representative of England, and was actually the defending Chiyoujin Olympic champion from the previous years. His name is a play on Robin Hood. His special move is the Tower Bridge. After collecting the Booster Ball from Meat, stand behind your opponent, and press . In the American M.U.S.C.L.E. toyline, Buffalo Man was renamed "Terri-Bull," and cast as the main "Bad Guy," and the head of the "Cosmic Crunchers." His special move is the Hurricane Mixer. After collecting the Booster Ball from Meat, face your opponent, and press . Wars Man only spoke once in the entire series, and that was to thank Kinnikuman for not killing him. He also dies more than anybody else in the series. His special move is the Screw Driver. After collecting the Booster Ball from Meat, face your opponent, and press . Legends say he is the reincarnation of the Hindu Goddess of Warfare, Ashura. He was the only Akuma Knight to survive the initial fight. His special move is the Ashura Buster. After collecting the Booster Ball from Meat, get behind your opponent, and press when you're close. Geronimo man was Brocken Jr.'s replacement in the American version of M.U.S.C.L.E. He was an Apache, and was the "Heart of Fire" for his tribe. His name is a reference to the native legend, Geronimo. His special move is the Apache Tomahawk. After collecting the Booster Ball from Meat, face your opponent, and press . Brocken Jr. was removed from the American version of the game due to his common depiction as a "good Nazi." Since Nintendo of America banned all references to Nazis, he was removed and replaced with Geronimo. His special move is the Red Rain of Pain. After collecting the Booster Ball from Meat, face your opponent, and press . This page was last edited on 13 March 2012, at 03:04.